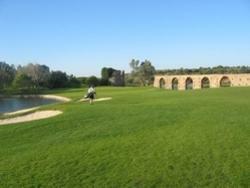 A modern villa set within the grounds of the Penha Longa Golf course. Guests have use of a 'Guest card' for the Caesar Park tennis court, health studio and the indoor and outdoor swimming pools. There is a twin bedroom with en suite bath room, and two twin bedrooms sharing a bathroom. In addition there is a smaller bedroom containing two single beds. Downstairs there is a hall, a spacious lounge and a well equipped kitchen. 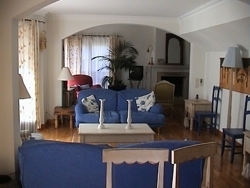 The villa is air conditioned and also centrally heated for those wishing to visit during the winter months. Outside in the small garden, there is a barbecue and a heated swimming pool 7 m by 4 m.
Its proximity to Cascais, Sintra, Lisbon and the Atlantic beaches also makes this an attractive property for non golfers. Penha Longa's history dates back to 1390 when a monastery was built which is now being lovingly restored by master craftsmen. These historic buildings and the surrounding gardens are a cherished part of Portugal's heritage. Lisbon is 25 kms. away and the historic town of Sintra with its palaces and parks is a short drive away. Those wanting the beach have a choice of the wilder west coast or the south facing holiday resorts of Estoril or the old fishing village of Cascais.